I keep seeing posts about Tummy Time, and how important it is, and how often we need to do it etc. But very few people mention this very important tip – don’t place your baby on her tummy; roll her over. 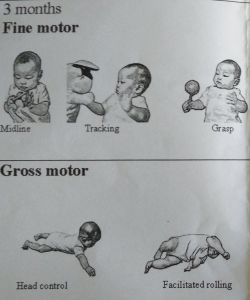 Our baby is slightly delayed in her gross motor skills at 3 months, and her pediatrician asked if we wanted to talk to a physical therapist for tips on what to do at home. Early intervention is important in all aspects of development (and healthcare), so we opted to meet with a PT to talk. Of course the very night before our appointment, I see this comment buried in a thread on the BeyondTheBump subreddit saying that we should be rolling baby onto tummy time – this is so that she understands the relation between being on her tummy and on her back, and just the general idea of rolling. The very next day, the PT says the same thing. Roll baby onto back/tummy for tummy time. Great! Why didn’t the pediatrician say that 2 months ago? Better now than later I guess. We can also just let baby lie on her side to get used to other positions besides back-lying. The other thing the PT mentioned which I didn’t know about is the transition to sitting. Baby likes sitting up so that she can look around. We have been holding her in our laps, or leaning her against us. 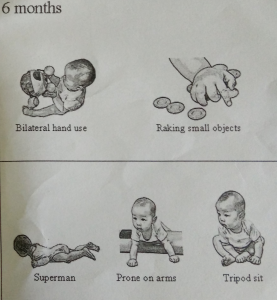 There is one more option called the tripod position, which is baby using her arms to support herself while sitting down. This pose is important because it strengthens her arms, preparing her to crawl. Of course, she is also slowly building arm muscle when she’s on her tummy, but tummy time doesn’t require as much arm strength. The PT recommended that we start this after 4 months. Tripod pose is the goal for 6 months. The last thing the PT mentioned was introducing our baby to her knee. I’m not sure what that’s about, but we haven’t really done it since baby is grabbing her toes already. Since the PT’s visit, we have been rolling her, and letting her sit in the tripod pose. As a transition, we also let her just lie on her side. She has accidentally rolled from tummy to back once at 4.5 months, on that rare day when she lay down while being on her tummy. It’s actually a really natural transition once she lays her head down while being on her tummy, to being on her side, and then on her back. I just can’t figure out how to encourage her to put her head down from puppy pose. If you have tips, share them!